Ah, Coco. Her lifestyle was shocking and her politics were atrocious. In spite of this she created wonderful designs that benefited the woman traveler. Many of her creations have become classics in the travel world. Coco’s father abandoned her after the death of her mother. She struggled with separation issues for the rest of her life. She was raised in a convent where she learned how to be a seamstress. Once out of the convent she headed in an entirely different direction. She became the mistress of several men (sometimes all at the same time). She even collaborated with the Nazis during WWII. This was a woman that did not care what others thought. Not only did she throw off the moral conventions of society, she threw off the binding garments that defined women. Her goal was ease of movement and comfort. One of Coco’s most famous quotes was “Luxury must be comfortable, otherwise it is not luxury.” We could modify that quote for travel – “travel clothing must be comfortable, otherwise it isn’t travel clothing.” Coco believed that freedom of movement enhanced femininity. Lets take a look at Coco’s contribution to travel clothing. Coco loved the outdoors. She loved riding horses and walking about. Corsets interfered with her movement and her ability to partake in athletic activity. She designed clothing that did not require tight fitting undergarments to look good. These loose garments became the predecessors to Coco’s sports clothing line. Most of our travel clothes have this same sport clothing style. Coco wore pants to the seashore as an alternative to the swim ensemble. Prior to this women only wore pants in a dirty work environment. Coco wore them as a fashionable outfit. Other women quickly picked up on the freedom that pants gave. Coco later mourned that women were wearing pants too much and wanted to see less of them at dinner parties. Coco hated the peacock colors of women’s dresses. She fought back with a simple calf-length black sheath that could be accessorized for any occasion. The little black dress (LBD) is a standard in most women’s closets, as well as their luggage. Does anything say “French” as much as the Breton stripe top? Coco loved going to the seaside. It was here where she noted the stripe top and bell bottom pants of the French Navy. She incorporated both of these items into her own wardrobe. 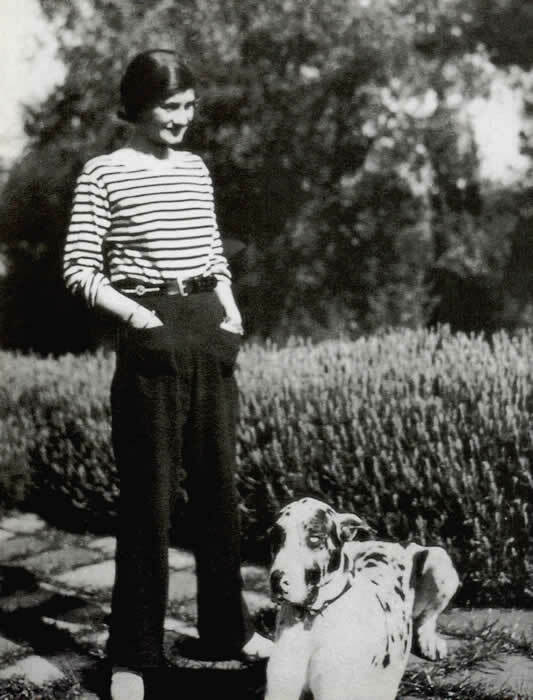 Many women have added the Breton top as a staple to their wardrobe. Like many of Coco’s pieces, you could dress it up or down. The stripes bring a bit of fun into a neutral wardrobe. Coco originally used costume jewelry as a counterpoint to her simple clothing designs. Faux jewels changed the look of her outfits. Today we use accessories to change up the look of our travel garments, making several outfits out of just a few clothing items. Thanks to Coco we can leave the expensive jewelry at home so we have less to worry about while on the road. Chanel hated carrying around her handbag, so invented the 2.55 quilted bag to give her freedom. The bag had features we enjoy today – an outside pocket for accessible items, an inner zippered pocket for valuable items, and a way to lock the bag closed. Coco was the first to take tricot, a knit used for undergarments, and use it for street wear. After jersey was invented, Coco quickly used it for cardigans and tops. Her jersey dress became a best seller. Coco incorporated pockets into several of her designs, from women’s suits to women’s handbags. Prior to this pockets were only added to women’s clothing as a special request. Coco made unobtrusive pockets a standard feature in her clothing line. Coco incorporated freedom into her wardrobe. We enjoy those same freedoms today. We no longer have to travel with trunks filled with corsets and pantaloons. We can wear simple styles and not feel underdressed. Coco’s inventions led to freedom for the traveling women. Do you have any of her designs in your closet? What a fun read! And what an inspiration.